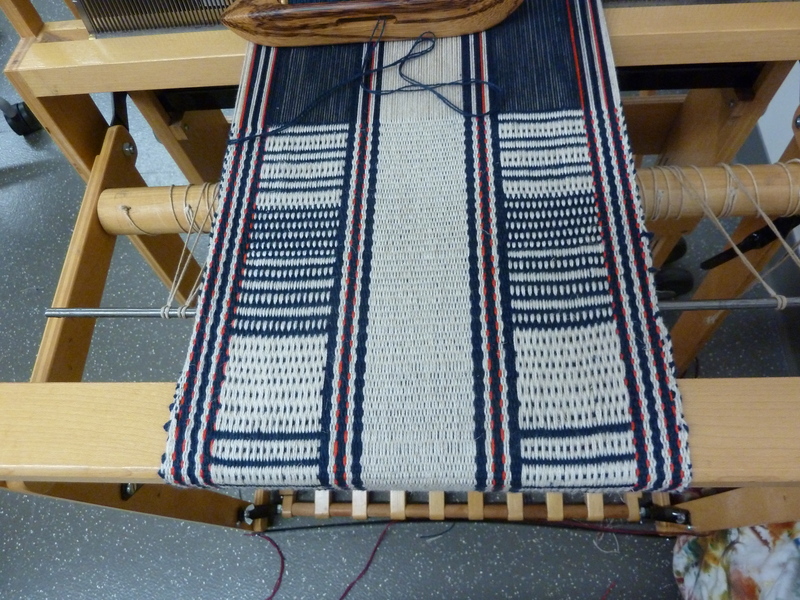 I got home yesterday afternoon after a week in Bellingham at the NW Weavers’ Conference. What a week! Western Washington University was the venue, and the grounds and staff were wonderful. We were in dorm rooms (I opted for a single) so the accommodations were rather spartan, but the bed was comfortable and my dorm was quiet. sleyed, threaded and tied on – finally! This was despite the fact I had spent 12 hours in the workshop room the first 2 days. I was very tired and getting a little frustrated! 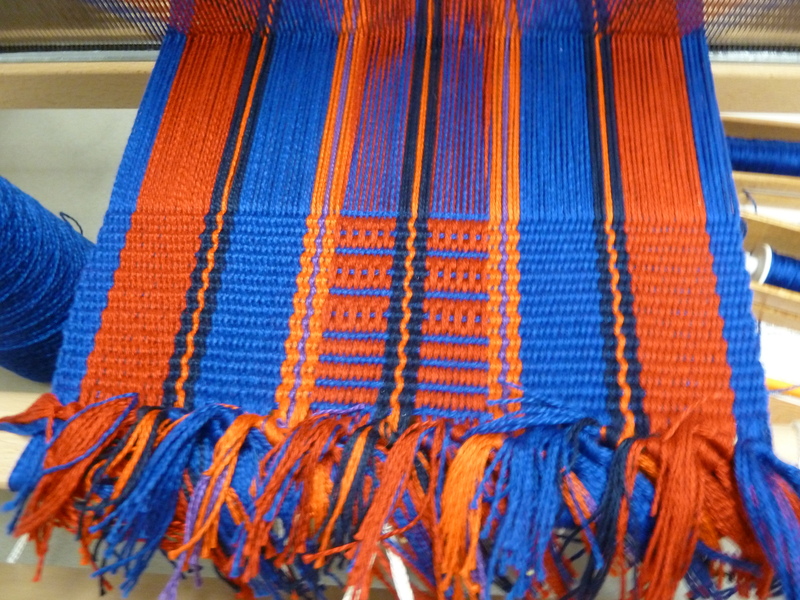 It also turned out it would have been much easier to warp the loom from back to front, but by the time she explained that, it was too late for the way I had wound the warp in my usual way for front to back. On the third day of the workshop, she was demonstrating various techniques, so I tried to take notes and some pictures while she was doing it. The workshop handout was brief and somewhat cryptic. 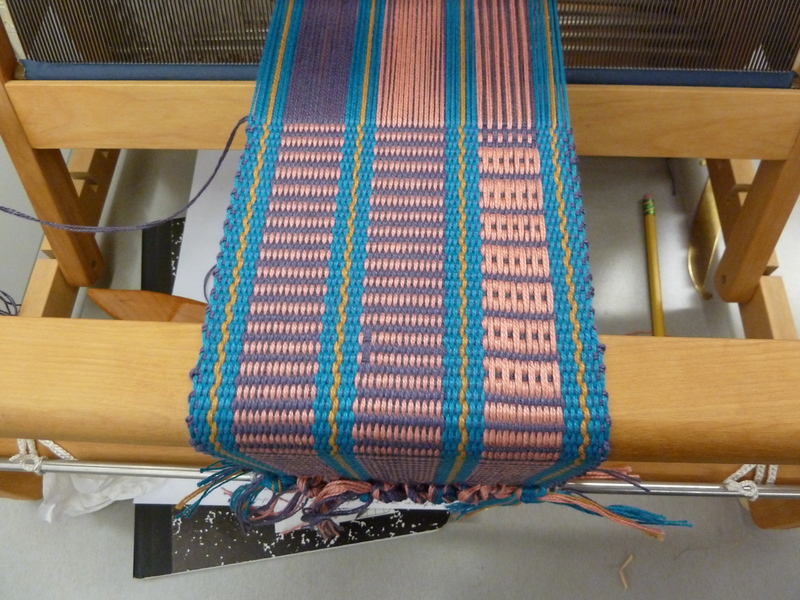 Fortunately, there were some women from Seattle Weavers Guild in the class, who were farther along than I was, so I also have some folks to go to with questions. 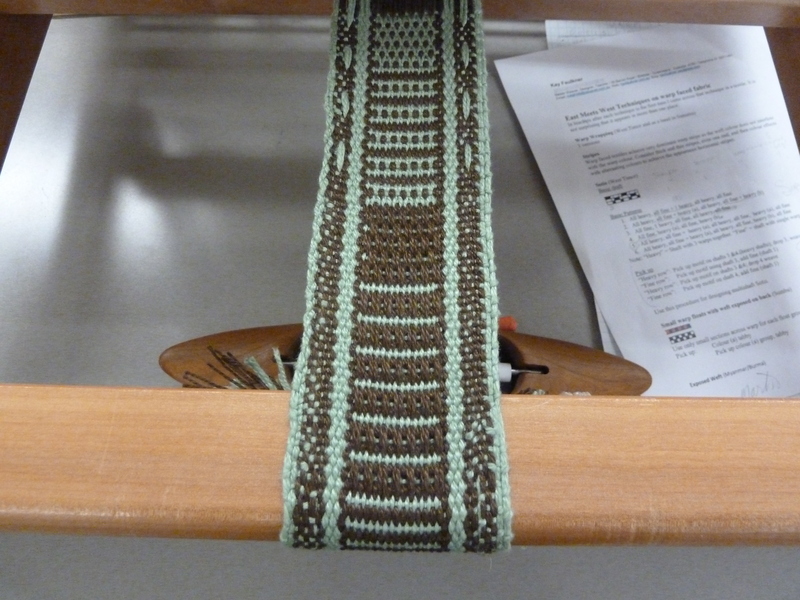 I did get started on the first set of patterns before we had to pack up on the last day. 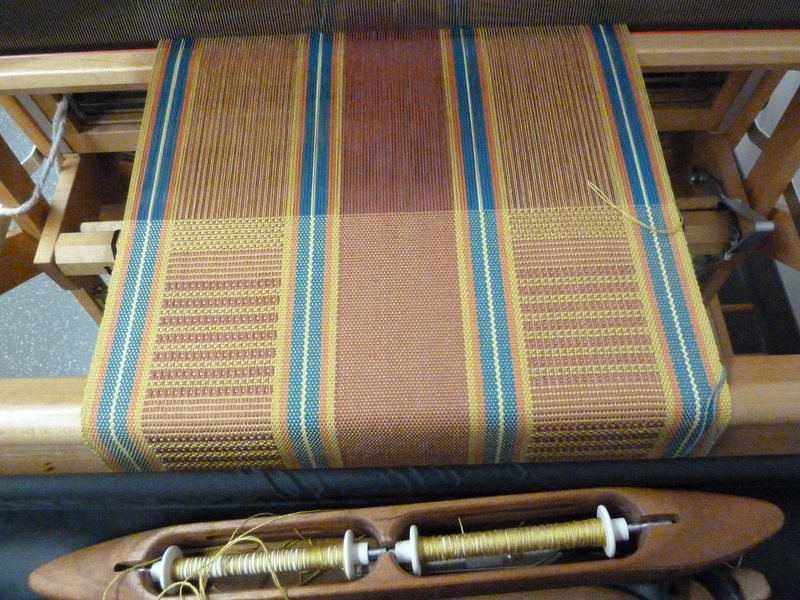 And I am excited about my warp, I really like the colors and if I can work my way through the techniques, I should be able to make the rest of it into placemats. So stay tuned for progress and pictures in the coming month. Meanwhile, it was fun hanging out with my friends who had also come over for workshops, and meeting new people. A number of people from the Methow Valley guild came over on Thursday for the actual conference, which includes 3 half-day seminars as part of the registration. The fashion show on Thursday was fabulous, many wonderful garments, and beautifully presented with music. 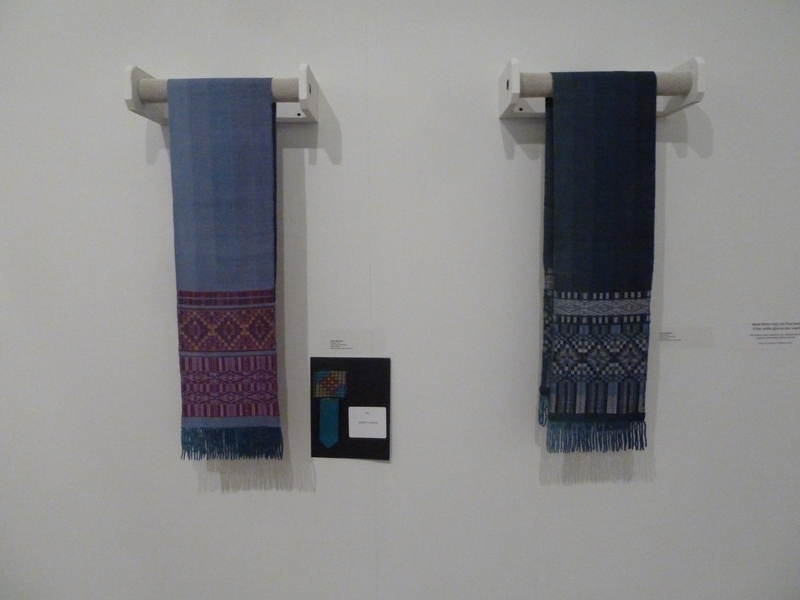 These garments were moved to the Western Gallery in the Fine Arts building on campus, where the Instructor Show, Open Show, and Juried Show exhibits were also to be found. 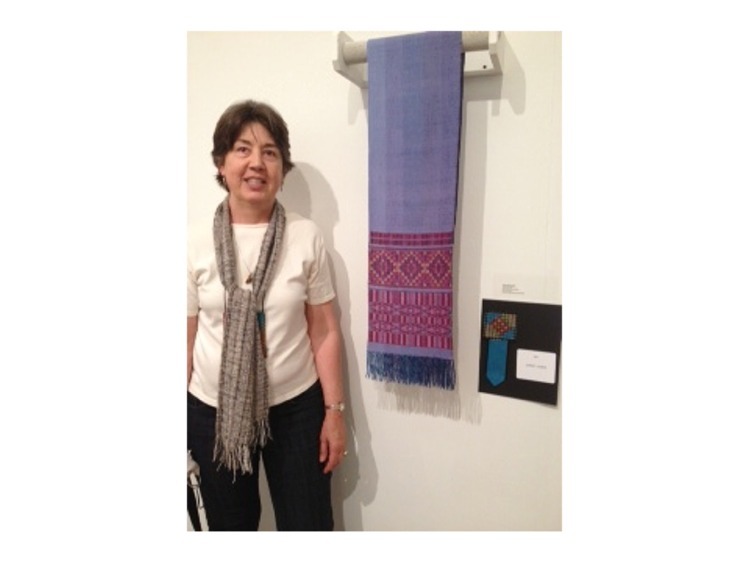 So speaking of the Juried Show, I had two of my polychrome summer & winter scarves accepted for that show. I had been pleased that the juror, Bhakti Ziek, had written some very nice comments on my entry forms when they came back to me. Well, as it turns out, she also gave me an award! Juror’s Choice 1st Place! I took all three half-day seminars from Kay Faulkner as well, as they had sounded the most interesting when I registered back in January. There were no handouts and lots of information, but I think I got enough of it to feed my brain and creative side for the next year or two. 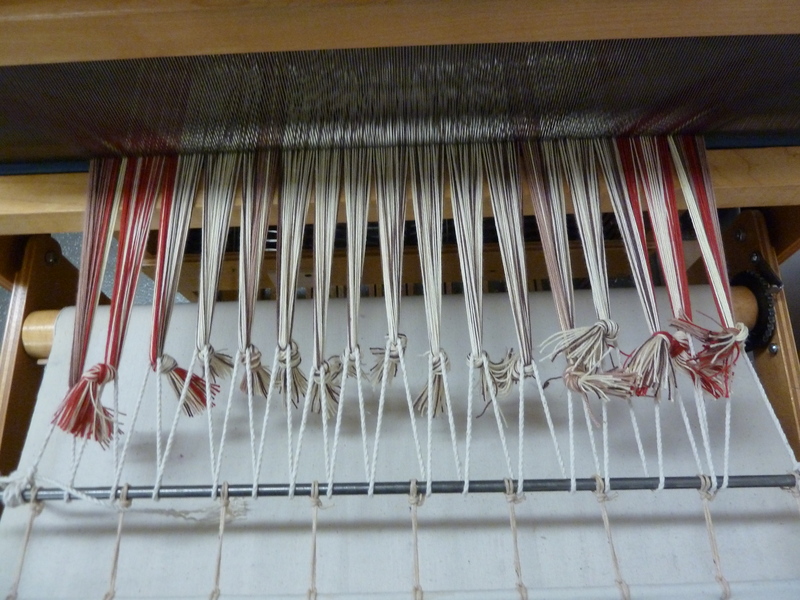 Tied weaves, double weave (way beyond the basics) and loom-controlled shibori. There was also a market with vendors big and small. I behaved myself pretty well, but did come home with a few tools (including a used LeClerc electric bobbin winder) and some lovely alpaca from Vancouver Island, for future spinning projects. Morrison Creek Alpacas, highly recommended. Your polychrome pieces are just lovely. It’s nice to hear critiques of teachers from students in there classes. Congratulations! That’s a great award! The scarves are beautiful. Hope to se them in person.